Under the label "Dr.Golf Fashion", the golf pro, Dr. Volker Bernhardt developed its own golf clothing. The aim of the design: The shirt should remain in his pants when swinging, freedom of movement while still looking good. 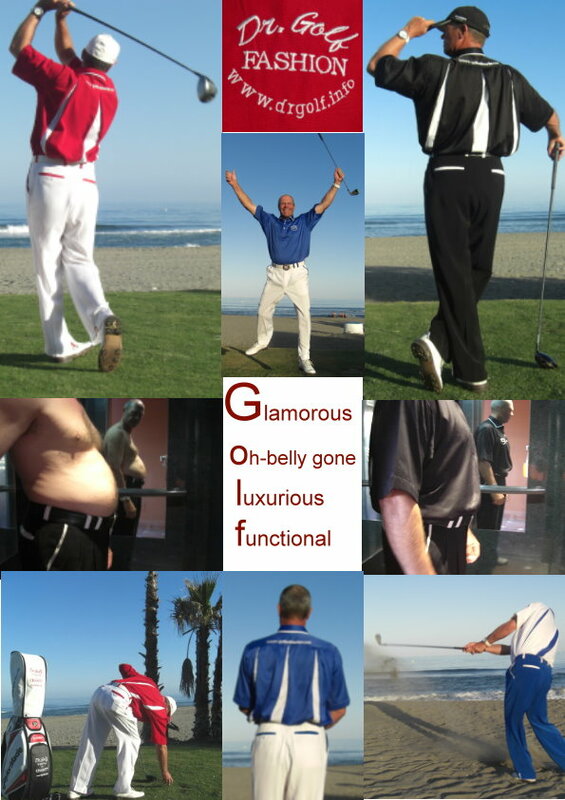 Especially the shirts are ideal for some stout golfers, because they cover up the belly and allow for free swinging. The cloth material feels great on the skin and is very easy to maintain, simply wash - hang - put on. G lamorous: the bio-color cloth combination looks outstanding and attracts the eye. O h-belly gone: the wide cut of the shirt and its functional pleats will cover up the belly and allow for a free golf movement. L uxurious: the silky material is providing the soft feel for the skin and a comfortable golf swing. F unctional: this special golf cloth design allows for free golf movements and learning aspects. I would be glad if you like my cloth creation? I already enjoy the free golf swing.